Last year on our trip to Paris, my boyfriend of 7 years and I got engaged. It was an absolute magical surprise, but once we got home, I fell into the deep hole that is online wedding planning. Having no siblings and, at that point, having only gone to one wedding in my life, wedding planning felt daunting. And Pinterest, with its perfect ranunculus bouquets and elaborate table decor, wasn’t helping. Thankfully, that was also the year I had started changing my personal finances for the better and was evolving from Spendy McSpendy to Ms. I-have-an-emergency-fund-thats-actually-not-going-to-be-blown-on-shoes. This new mindset allowed me to look at wedding planning in a different light, and it helped us navigate the expensive wedding industry. It wasn’t easy saving for a year and a half, but we did learn a few things along the way. Below are the six things I learned from saving and paying for the wedding of our dreams without going broke. 1. Have a heart-to-heart with your partner about how you both see the day going and how much you’re each willing to spend. This talk should happen right before any venues are booked or the guest list is made. You may think you know what your partner wants, but you won’t fully know until you both discuss it in a no-holds-barred conversation. You may end the conversation not having agreed to everything, but you should at least be on the same page regarding how much you are willing to spend. It’s also helpful to do some research before this conversation and create a mood board of what you’d like your day to resemble with photos and prices of venues you have in mind because your partner may not even know what your vision is, and it can be eye-opening once you start to see prices. In our heart-to-heart, we made the decision to pay for our wedding ourselves because we didn’t want to burden our families, but making this decision also meant we needed to create a savings plan to determine how much we were willing to put aside for our special day. 2. Guests can make or break your budget. Yes, I know this seems so obvious that it feels silly to even mention, but your budget will depend heavily on your guest count. It’s very easy to get carried away once you start planning because people will come out of the woodwork to congratulate you on your engagement, and you start imagining about how amazing it would be to have every person you’ve ever known celebrating your most special day. This seems great in theory, but in reality, a large guest list means more planning. Plus, inviting distant family, friends, and coworkers means spending money that could have been used for a better catering place or extending your time on the dance floor. We were lucky in the sense that both our families are quite small so we could invite most of our immediate family members, but even that didn’t stop us from deliberating about some people in the “maybe” category. By the end, we decided to just have an intimate wedding with only immediate family and close friends, and since we were paying for it, it was a lot easier to say no. People might get offended, but just keep the “it’s your day” mantra in your head and power through. 3. Believe it or not, a backyard wedding is not the cheapest option. An option that kept coming up as I was planning was to have a backyard wedding. It seemed to be the most affordable option because we wouldn’t have to pay a venue cost if we were using the backyard of someone we knew, and most NYC venues were charging a 10%-20% venue rental fee on top of all the other wedding fees. But once I started doing more research, I learned that a backyard rustic wedding may look affordably beautiful on Pinterest — but you have to budget to have everything brought into the space, such as the tables, chairs, cutlery, serving dishes, napkins, and even a port-a-potty for your guests. Which, let me tell you, is quite expensive for something that is a step above a music festival toilet. We ended up finding a restaurant that had a garden in the back, so we had our rustic feel without having to worry if we rented enough spoons for everyone. 4. DIY your flowers — but only if you find this fun. Holy cow, wedding flower arrangements are expensive! This may not be the case in your town, but in major cities, prices can range from $800-$3,000 for a few bouquets and small table arrangements. I absolutely love flowers, but there was no way I could stomach the quotes I was getting. Instead of going with a professional, I purchased a few bunches of flowers and greenery from a wholesale online flower store, picked up some cheap vases and candle holders from thrift stores, and watched as many how-to videos on YouTube I could find. This easily saved our flower budget and it’s a fun activity to do with your bridesmaids or mom. I actually did the arrangements with my husband the day before our wedding, and we had such a fun time putting the flowers together and reminiscing about our past. A few happy tears were shed while working together, and I cherish this memory of us. I will caution that you should only DIY something that you find fun because these things will take time, and there’s no reason to be stressed and upset because you decided to make your own bouquet. If flowers aren’t your DIY thing, find something else, such as making the menu cards or place cards, creating the photobooth backdrop, or learning calligraphy for signs. This is your time to be creative! 5. Hire a Wedding Coordinator, please and thank you. Our wedding was a mostly DIY affair, from the flowers and decor to even my hair and makeup, but a piece of advice I heard time and again was to hire a day-of coordinator. I pushed it off because I thought it would be too expensive, but a coworker put me in touch with his daughter’s wedding venue coordinator, who worked as the main coordinator for an event space but also did her own wedding coordinating on the side. She was excited to work on our intimate wedding and wanted to build her portfolio, so she gave us a great price. And honestly, we were so grateful to everyone who kept telling us to get day-of help. It allowed for my partner and me to have relaxing mornings (well, as relaxing as a wedding day morning can be), and we got to take our first look photos around the city before the ceremony. When we were done shooting, we arrived to a beautifully decorated garden, and all we had to do was to get married. It was an amazing feeling having our family and friends just be guests of honor at our wedding and not have to have them work to set up or break down the space. There were also a few hiccups, such as having someone show up even though they had RSVP’d no (yes, that happened), but everything was handled by our coordinator without a hitch and we got to enjoy our day, which flies by. You may also be thinking that a friend can do this, but I think the level of responsibility heightens when you’re paying someone to do it, so let your friends be guests and leaving this to a professional. This was money well spent, and if I could scream it from the rooftops, I would. 6. 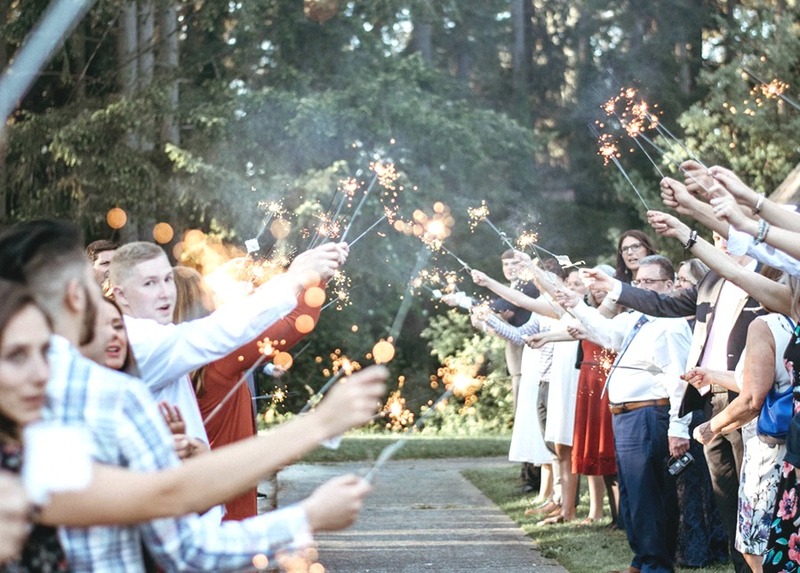 Your wedding may not be the typical wedding and that’s okay. It’s also ok if it is. Don’t let anyone fool you into thinking that weddings only come in one size. We cherry-picked things we wanted, such as having a wedding cake and ending the night with a dance party with our 35 guests, and let go of things that didn’t work for us, such as having a wedding party and wedding shower (to the disappointment of some family members). We also didn’t have a DJ and instead made Spotify playlists for every moment, from the parent dances to the dance party, which was a hit. Picking and choosing details that worked with our budget allowed us to save money and allocate funds in places that mattered to us. It also made our wedding our own and made it worth spending on. The day after our wedding, we were lying in bed reminiscing about how well the day went, fulling experiencing the post-wedding high. We couldn’t believe how nice the weather was, and how lovely it was to see everyone. But what filled us with the most joy was that we were able to accomplish our goal of saving for our wedding and honeymoon, and we were now starting the marriage chapter in our lives debt free and with new possibilities. This made us proud and made our wedding memories that much sweeter. Weddings are different for everyone, but sticking to your budget and having real conversations with your partner can truly help guide you through the crazy world of the wedding planning — fancy port-a-potties and all. Maria lives in NYC and enjoys writing about personal finance, skincare, and travel. Her main goal in life is to run a sloth sanctuary out of her Queens apartment, but she’ll keep writing in the meantime.